Want a cheddar ale soup recipe that’s sure to impress? This recipe, with its complex flavors, will do exactly that. Combining vegetables, ale, Worcestershire sauce, dry mustard, and showcasing Cabot Extra Sharp Cheddar, this cheddar ale soup delivers coziness in a bowl. Once you’ve made this recipe yourself, share it with family and friends on Facebook, Pinterest, Instagram, and Twitter! To make this cheddar ale soup, begin by melting butter in a heavy medium-sized pot over medium heat. Add onions, carrots, celery, garlic, and bay leaf, stirring occasionally, cooking until vegetables begin to soften. Reduce heat to medium-low, sprinkle flour over the vegetables, stirring occasionally, and cook for about 3 minutes. Gradually whisk in milk, followed by the broth, and then the beer. Bring to a simmer and cook for approximately 5 minutes, whisking occasionally. Stir in the Worcestershire sauce, dry mustard, salt, and pepper. 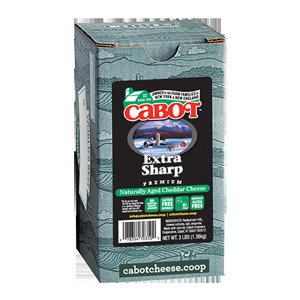 Reduce heat and add grated Cabot Extra Sharp Cheddar by the handful, stirring constantly, until all of the cheese is melted and the soup is hot (be careful not to bring soup to a boil). Discard bay leaf, sprinkle with crumbled bacon, and serve. For another delicious soup recipe that will warm you up during the colder months, be sure to check out our Spicy Hot Potato Soup. 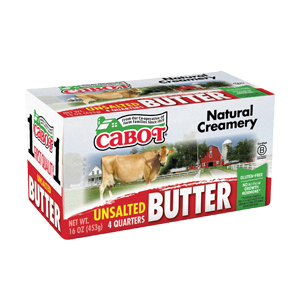 Did you know that Cabot is owned by 800 farm families who work hard to ensure that all of our products are made using only the finest ingredients? That’s why we’re confident that you’ll love this cheddar ale soup. We’d love to hear your thoughts so, if you’d rate and review the recipe after trying it out, we’d really appreciate it! MELT butter in heavy medium-sized pot over medium heat. When butter is hot, add onions, carrots, celery, garlic and bay leaf. Cook, stirring occasionally, until vegetables begin to soften, about 5 minutes. REDUCE heat to medium-low. Sprinkle flour over vegetables and cook, stirring occasionally, for 3 minutes. WHISK in milk, then broth, then beer. Bring to simmer and cook, whisking occasionally, for 5 minutes. STIR in Worcestershire, mustard, salt and pepper. REDUCE heat and add cheese by the handful, stirring constantly, until all of cheese is melted and soup is hot (do not let soup boil). DISCARD bay leaf and serve sprinkled with bacon. Recipe courtesy of The Essex Resort & Spa, Essex Junction, VT.
Great taste. Easy to follow directions. I omitted the onion and garlic, because I don't like them. I served it in a bread bowl. I would like to upload a picture. **Although you can't upload a picture on our recipe site, we would love to see it on our Cabot Creamery Facebook page! This was amazing Recipe! Lot of ingredients but very easy to make. I substitute the Bass ale with Switchback Ale "True VT Beer" and I used a crockpot! This recipe for Vermont Cheddar Ale Soup is wonderful!!!!! My husband and I have tried several recipes and we agree this one is our all time favorite. The carrots and celery give the soup great flavor and the chicken broth gives it a hearty taste. Very good on a cold Vermont wintery day!